Creating a roadmap to success needs accurate measurement and tracking. This is no different when it comes to measure your SEO performance, especially when it is being outsourced to an agency. Recently I had the privilege to hold a short session on SEO performance for a senior management team of a large international corporation in the cosmetic and skin care industry. As against to PPC metrics which are far more evident and easy to track thanks to Google AdWords’ robust reporting features, SEO on the other hand is too foggy for most marketers and senior leaders. 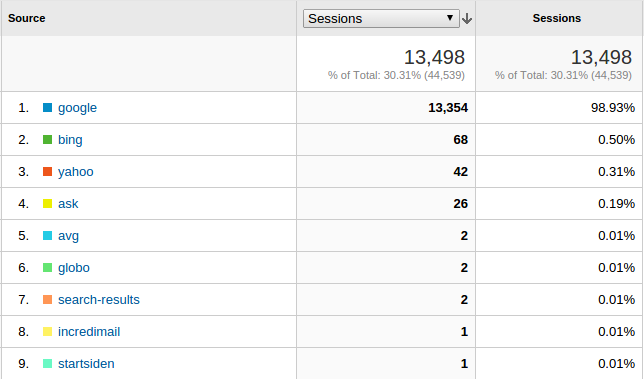 This is due to SEO’s technical sides which are, let’s admit, quite difficult to comprehend and follow for many of you. Fortunately, the good news is that SEO can be measured and monitored quite effectively. Since there could be quite a large number of trackable metrics, I tried to focus on the most essential ones, especially from a business perspective. 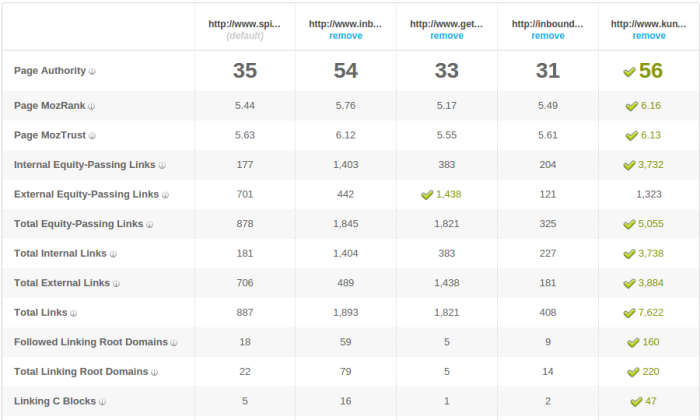 These metrics are supposed to show the SEO performance as against the efforts and costs associated with the ‘campaign’. The effectiveness of any SEO strategy and initiatives should be regularly measured and closely monitored by associated KPI metrics. Only this way we can properly align our resources and efforts for better performance. But what are those metrics we should pay close attention to? Where and how do we obtain them? First and foremost, you must define the overall goals you want to achieve with your website. In other words, what are the main business goals and objectives you expect to get from your visitors and what are the most valuable actions you expect to get from them? Last but not least, what are the expectations of senior executives in terms of SEO performance? Now, let me guide you through the most critical SEO performance metrics I collected in this post. Hope you’ll enjoy it and find valuable enough to get it implemented within your organisation. In general, there are three main fundamental volume and quality based KPI metrics with which you can measure overall performance of your SEO strategy. 1.1 What contribution has organic search engine traffic to the overall traffic of your website? At least, on a monthly basis, keep track of the main sources your visitors are coming from. These sources are supposed to be the acquisition channels the success of your business depends on. In my post I’ll be focusing more on search engine traffic and within it the organic one as this one relates to your SEO performance. As a marketing manager you should always be aware of the changes these channels show periodically (weekly, monthly, yearly) and get alerted in time when tracked data is not satisfactory. For example, if you detect a sudden drop in your search engine traffic, you might consider your site has been hit by a search engine penalty (Penguin, Panda). On the other hand, a sudden spike in your search engine traffic might conclude an increase of organic ranking for a certain term or phrase. Now, in the next section we’ll cover the importance of the search engines you should pay attention to. Which search engine to consider? In general, the answer would be Google of course but there are still few exceptions. For example, there is Yandex in Russia, Baidu in China, Yahoo in Japan and Seznam in Czech Republic. The logical consequence of this is that you must be aware of search engine market share within your geographical region and always take in account each one of the search engines your website gets organic traffic from. For example, if you notice a sudden traffic fall from each one of the search engines, it’s a strong signal that your site might be blocked from search engine spiders thanks to a fatal error of your development team. Although there are slight differences in optimising your websites for different search engines, I always recommend to prioritise Google and follow their Webmaster Guidelines. You can further aggregate this data by search engine and type of device. It’s up to you and the expectations of your chief executives, how and in what form do they want to see SEO performance. I’ll get into more details in the ways you can easily visualise your data by the end of this post, just keep reading. Organic rankings relate to the ranking positions of web pages for relevant terms being searched by users in major search engines. Bare in mind though that bygone the days when your pages had exact rankings for a certain keyword term in Google’s organic listings. Google’s continuous improvements and efforts to fight spammy or black hat tactics and maintain their recognition as top leaders in the search engine industry has finally paid off. Nowadays, you can not claim to have a certain or exact ranking for a particular term. In recent years, based on several ranking factors among which user’s historical search data, geolocation and user experience data, Google’s SERPs got diversified and became far too dynamic to chase after rankings. In addition to this, a highly ranked page is worthless if it does not result in a certain conversion as part of our business goals. As a rule of thumb, you should aim to measure performance by group of keywords describing a particular theme as a whole rather than one-by-one keyword rank tracking. This should be a new approach in measuring SEO performance after Google’s major and revolutionary Hummingbird algorithm change in September 2013. This change resulted in understanding search queries as against of word matching within the content of a page. Besides the technical advancement Hummingbird offered, it was the beginning of semantic or entity search with the ultimate goal of understanding users’ intent while searching in Google. Which keywords are driving sales or revenue to your business? It is crucial to identify top competitive keywords within your niche. These keywords are supposed to be closely related with the services or products you’re trying to market. Having identified all the keywords relevant to your industry, you’ll have the ability to track their performance. By performance here I mean, average organic ranking on per a month-to-month basis, traffic volume reach and number of conversions (transactions, sales and revenue). Aim to identify low hanging fruits, for example, a keyword with an average rank #7 with relative high conversion value, could most certainly bring more on the table with a higher ranking. By low hanging fruit, here I mean, the less effort you might need to get short term results strongly associated with a huge monetary value. To help you ease the keyword discovery process and reveal high performing keyword phrases, here are few of the tools I personally use and would highly recommend for you as well: HitTail, UberSuggest, WordTracker, LongTailPro, SpyFu and KeyWordTool.io. In the next section you’ll find out why average rankings become the status-quo as against of any exact rank measurement. Due to lack of Google Analytics providing us with keyword data since the introduction of encrypted search (SSL or https://) in 2011, a privacy concern Google needed to take action on to provide a more secured online experience for its users, it resulted in (‘not provided’) data. In brief, all this meant that Google has not been passing through queried keyword data anymore, becoming a status quo of its kind. Although this one data was one of the most evident ones as strongest proof for tracking and measuring SEO performance, webmasters and agencies along, needed to come up with new methods to measure performance. In order to have a closer look on average rankings for your top competitive keywords, you must register your domain with Google Webmaster Tools then if possible connect it with your Google Analytics account. Bare in mind though that for sake of accuracy, you’ll need to filter down your data to the specific geolocation you are aiming to grow your business. Having done this, you can instantly get reports like the one below in which you can easily identify low hanging fruits. In this case, by low hanging fruits I mean relevant terms within the average ranking range of 5-20, all those terms which need less effort to boost their rankings with further on-page and off-page tweaks. Despite Google’s dynamic SERPs, there are still many advanced rank tracker tools available on the market, tools capable to track ranking data of individual keywords based on language, Google domain use and geolocation of a particular market. Just feel free and check out few of these tools and decide on which one would best suit for your needs: RankWatch, Link-Assistant, ProRanktracker, Ranktrackr, RankRanger and AdvancedWebRanking. This metric also plays a crucial role in measuring the overall SEO performance of a website. In the event, this number is decreasing, there is certainly something wrong, which should be sooner or later diagnosed to identify the exact cause of the sudden drop. 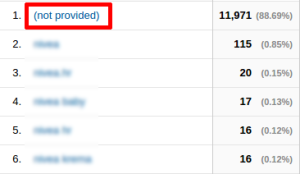 Here again, you can use Google Webmaster data, extracted through your Google Analytics account (if the two are connected). You should aim to further filter down your data by number of clicks which should be obviously greater than ‘0’. Eventually you could filter on a more granular level like geolocation and so forth. What is more important though, is to always have a track record of the number of pages getting organic traffic as against to a previous time interval, preferably on a monthly basis with optional but recommended daily alerts. To make it clear for newbies and rookies alike, the more time spent on a page or more other internal pages visited throughout a session (a visitor’s time spent on a site without interruption in a 30 minute timeframe) the lower the bounce rate you get. 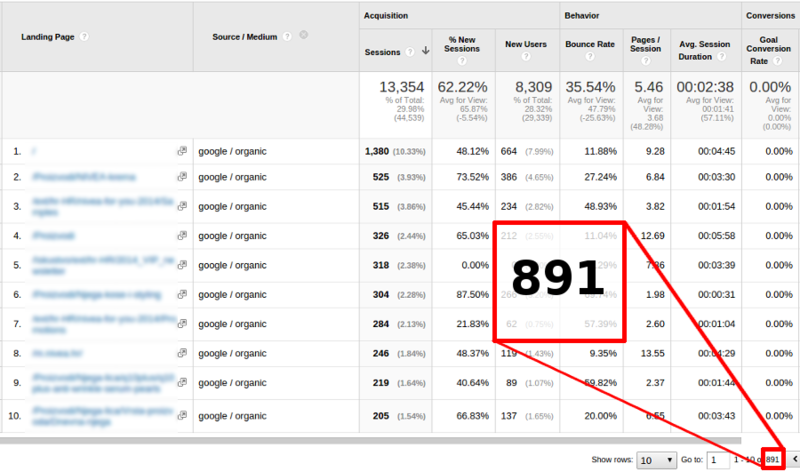 As a consequence, you should aim to keep your bounce rate as low as possible. 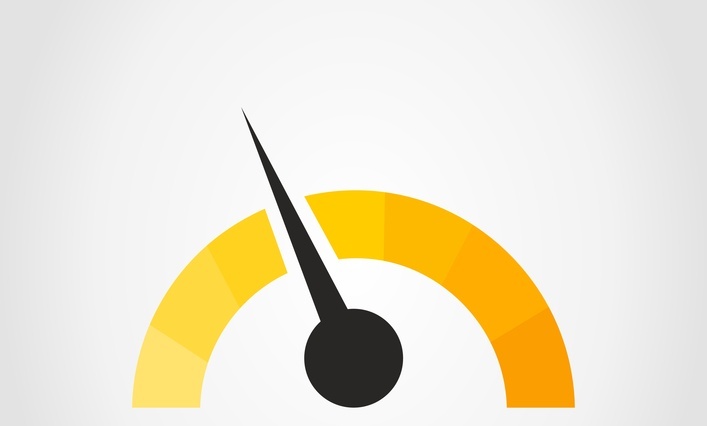 When it comes to measuring SEO performance, we need to evaluate our overall bounce rate values residing from search engine’s organic traffic. Bounce rate is supposed to play the role of a behavioral metric most certainly one of the ranking factors Google is taking in account. As such, you must get assurance there is a close correlation between the searched term and the intent with the content your page offers to your users. The lower your bounce rate, the higher your overall pages per session which means highly engaged audience. You need to get your users engaged and direct them to take actions. Sometimes, especially in case of blog posts, a high bounce rate might not necessarily mean low performance. The simple reason behind the high bounce rate is that users don’t continue their journey through the site after their first initial content consumption on the page they landed on through a particular search engine. In circumstances like this, you as a business or website owner, need to implement some sort of call-to-action on your pages. Some of the most common call-to-actions used are further recommendations to read at the end of the post, behavioral opt-in forms (newsletter subscription, free ebook downloads). The idea is to offer some strong incentives for your users to entice them not to leave your site after consuming their first content on your website. Another alternative which is sort of more technical, would be, to extend your site performance measurement for better tracking users’ time engagement and see it within your Google Analytics account. For a quick solution I would highly recommend the implementation of the Riveted plugin and eventually read through Rob Flaherty’s guide on his Medium post. I’m including referral traffic since it is strongly connected with SEO performance, considering the quality of backlinks pointing to your site. Whenever you notice a sudden drop of your referral traffic, it might have a negative consequence on your organic traffic as well. There are many robust tools with which you can closely monitor the performance of your referral traffic, tools like OSE, Majestic or ahrefs just to mention a few. Still, it might be quite enough to pay attention to the data available in your Google Analytics and Webmaster Tools accounts. This might be important to identify low hanging fruits or opportunities. Usually, pages or keywords with high number of impressions but low to zero clicks, means unexplored opportunities. You can get this information through your Webmaster Tools account but you need to analyse it on a more granular level to pinpoint these missing opportunities (pages or keywords you might consider to allocate more resources). Adding monetary values to our SEO efforts is inevitable. This is more than imperative to evaluate performance of any campaign regardless of its kind or the channel it involves. It’s especially important in the case when we outsource these kind of activities. We need to measure performance in monetary values regardless of the complexity SEO is known for. 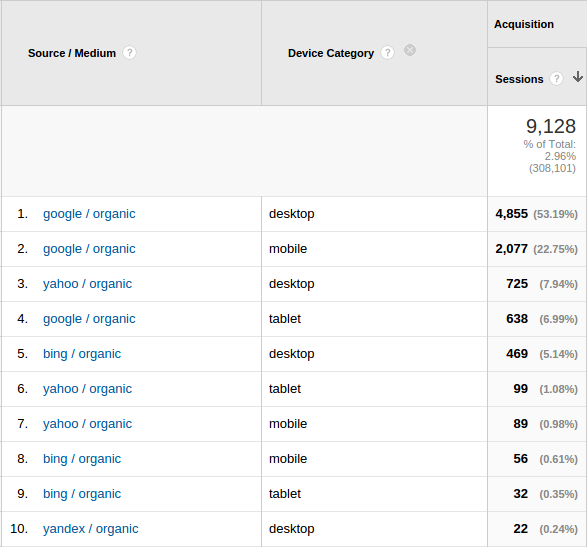 These are e-commerce data you can find in most of the reports within your Google Analytics account. A quick way to filter down revenue and transactional data for visits coming through Google’s organic listings would be to use Google Analytics’ left side navigation as follows: ‘Acquisition\All Traffic\Source/Medium\’google/organic’. You’ll get ecommerce conversion rate, number of transactions as well as monetary revenue as you can see in the attached screen capture below. To better illustrate how ROI should be calculated, I’m including a simplified formula with an example. The goal with ROI is to reach a positive figure as in my example when the ROI reached over 97%. All the figures needed to accurately calculate your ROI are available in your Analytics and Webmaster Tools plus the SEO service costs you pay for your agency or freelancers. You need to be aware that besides the default data tracked by Google Analytics, the analytics platform allows you to integrate any other external data which can be later used for more accurate reporting. This task worth at least one separate blog post but to better understand the possibility behind this technique, here is a detailed explanation on how data can be imported within your Google Analytics account. 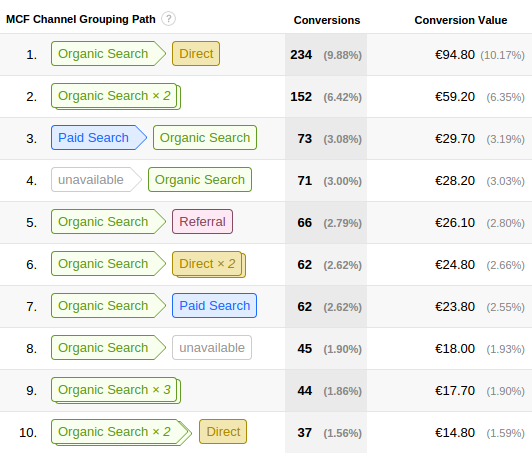 This report shows us the percentage each channel took along the conversion paths our website users have taken. 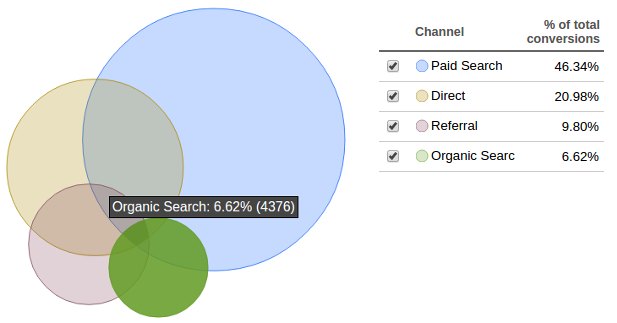 In the example below, the organic traffic channel or SEO has registered a close to 7% conversion share besides paid (46%), direct (21%) and referral (9.8%) channels. With so many channels and devices now available, our customers’ journey became extremely diversified and we can not claim any longer that a certain channel gets credit for a conversion. 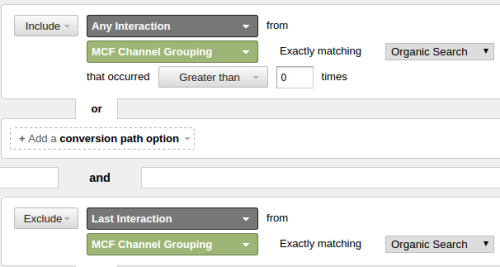 A common mistake is to evaluate your channels performance by the last-click attribution model, meaning, the channel through which the last click came prior conversion. The reality is that users tend to revisit our sites through different channels, a combination of these prior converting. Thi is what we marketers and managers alike need to take in account while evaluating channel performance, especially when it comes to prove our ROI for each individual channel. We need to identify all the navigation patterns our customers make and try optimising these patterns for better performance. Needless to say the content, social and other marketing tactics we need to fully synchronize to accommodate these patterns. 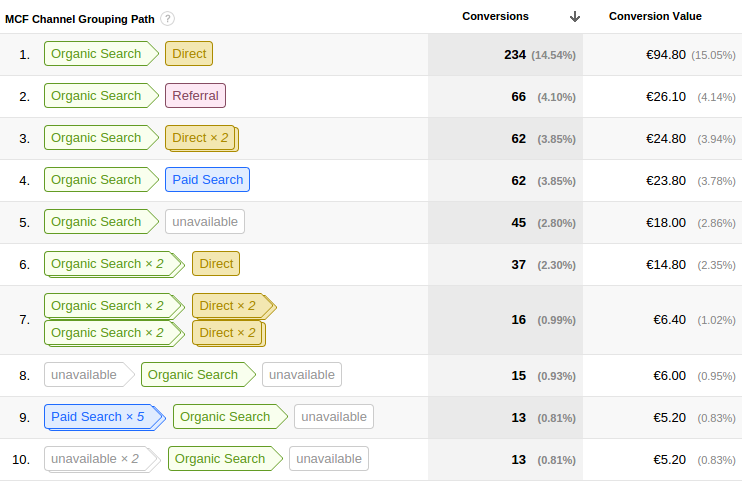 As we can see, organic traffic had a huge impact on brand awareness, considering the top conversion path in this case was the Organic/Direct with 234 conversions. We can also easily spot the impact of the Paid search had on organic search (#3). What was the non-direct contribution of our SEO efforts on the overall performance of our website? In the attempt, your site measures both goals and ecommerce values, it’s highly advisable to split this report into separate segments by using the conversion filter found in top navigation elements of the Top Conversion Paths report. This report can be also attributed to your SEO performance or at least show you additional keywords you might consider having them as part of your overall keyword strategy. This means, that you might consider building up additional landing pages targeting terms which are otherwise highly searched by your users while already on your website. 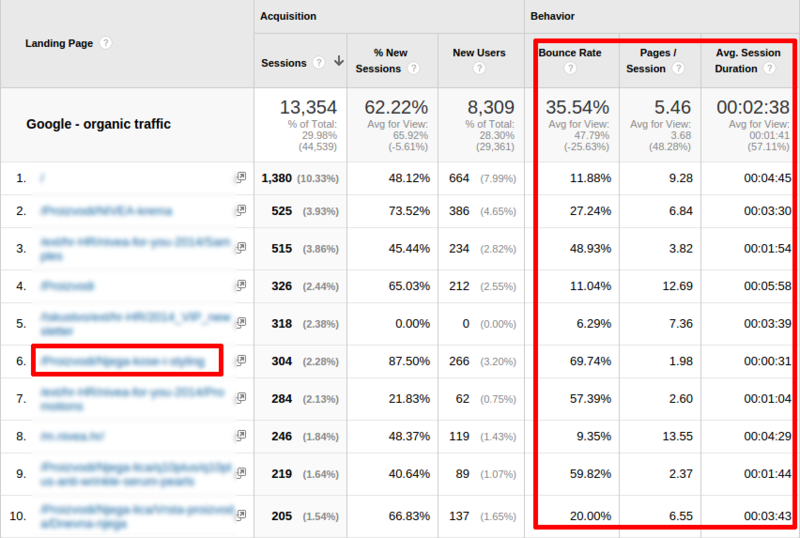 To see this report you must first configure your Google Analytics to track these internal searches. You can find this settings within admin of your GA account under View settings. 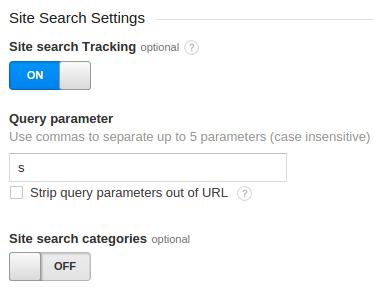 You must also identify the search parameter being used by your CMS framework, in my example it was ‘s’. There can be tremendous amount of competitive data in tight connection with SEO performance. Maybe one of the most used and known comparison dashboards is that of MOZ’s page or domain specific metrics as seen in the below example. With reports like this one, you can easily show to your executives what are the sites’ strength and weaknesses as against to your competitors. Reports like this one might help you justify the need for more budget to your SEO campaigns or strategies, no matter what it’s aimed for, be it either for content marketing or link earning tactics, as long as it proves its efficiency, it might be worthwhile to take in account. You might be wondering how you could show up a report to your senior executives which strongly suggests that your brand is being overtaken in Google’s organic listings by some of your competitors whose brand are not so popular. To find out, I used iSpionage, a competitive intelligence spying tool with which you can practically find out loads of valuable information about your competitors. I picked the brand Airbnb which is quite popular and compared it with a less popular one VRBO. The result speaks for itself. Check out and compare the two charts below. You might also be wondering what is your overall SEO traffic value as against to your competitors. 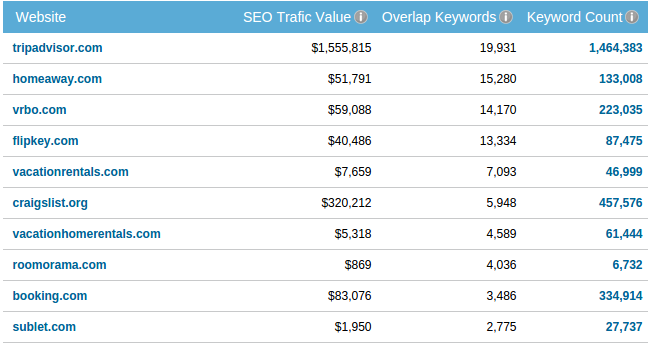 Once again, I used iSpionage and as you can see in the below report the airbnb’s $7,264 SEO value is by far being overtaken by VRBO with its $59,088 SEO traffic value. Definitely these are estimated values calculated by CPC data throughout Google, Bing & Yahoo search engines as well as estimated traffic volume coming for these keyword phrases from first page. Now it’s time to simplify our reports. There are several ways we could simplify this process. It much depends on the data sources we want to use and how we can fully or partially automate the data processing and reporting. Now, instead of getting into details on how you could take leverage from these tools, here are two tutorial videos I’d highly recommend watching through. Now, I really hope you found my post really useful and would more than welcome any remarks, further suggestions or thoughts from your side. There might be several other ways to measure, evaluate and report your SEO performance and sharing your approach with all of us would make us in this industry even smarter. So, I highly encourage all of you sharing my post and leave your comments below.